Murray Walker OBE – Legendary F1 Racing Commentator, Broadcaster and After-Dinner Speaker. Murray Walker began by racing motorbikes, following in the footsteps of his father, motorcycle TT champion Graham Walker. Walker Jnr. had some success, winning the gold medal in the International Six-Day Trial in 1949, but then chose to move sideways into commentating after a spell in the army. After active service in World War II, Murray Walker forged a successful career as an advertising executive, handling the accounts of blue-chip firms such as Mars, Esso and the Co-op. His debut as a sports commentator came in 1949, when he covered the British GP at Silverstone for BBC Radio. Until 1978, Murray Walker was a part-time commentator fitting in his commentating duties at weekends. After James Hunt’s victory in 1976, the BBC decided to start broadcasting all of the Grand Prix, and asked Murray to become, as he has been since, the voice of Formula 1. Murray’s style of commentating was unique. His high-pitch, high-speed delivery made even the most routine of developments seem exciting. He was known for his enthusiastic, sometimes apoplectic style of commentating, often getting carried away with events and having to be corrected by his calmer co-presenter Martin Brundle. However, his distinctive style is a major contributor to the enjoyment of watching F1 in the UK. Murray Walker is passionate about motor racing, and, over-enthusiastic mistakes notwithstanding, has an awesome knowledge about the sport and its history: it is not unusual to hear him say during a race something like, ‘And that reminds me of a similar incident in 1964’ and then go on to recount the details! Murray Walker has often said how much he loves Formula 1, even going so far as to say, ‘Cut me, and I will bleed Castrol-R!’. 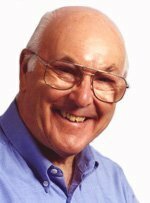 Murray Walker has spent more than 50 years commentating on motor racing and in particular F1, initially for the BBC before moving over to ITV in 1997. When the man who made famous the catchphrase ‘Unless I’m very much mistaken… I AM very much mistaken!! !’ announced that he was retiring as ITV’s Grand Prix commentator at the end of the 2001 season, the media reacted as if the sport itself was losing one of its biggest stars. His high-octane delivery kept viewers on the edge of their seats, while his passion for talking about the sport he loved was matched by an all-encompassing knowledge gained through hours of painstaking research before every race. In April 2006, Murray Walker returned to the microphone to commentate the Australian Grand Prix for Australia’s Formula One broadcaster Network Ten. He is also Sky Sports’ commentator on their coverage of Grand Prix Masters.